April 4, 2018 - 9:00am – April 30, 2018 - 5:00pm04/04/2018 9:00am 04/30/2018 5:00pm Exhibition on view: Architecture Fellows, "Architectures by Proxy"
Laida Aguirre is an architectural designer and artist currently based in Los Angeles, CA. She holds a BA from Northeastern University and a Master of Architecture from California Polytechnic Pomona where she is currently Adjunct Faculty at the Department of Architecture. She is the recipient of the Chapman Technology Award, the Dangermond Scholarship and the Richard Neutra Award for Best Graduate Thesis for her project 'Catalog Tectonics’. 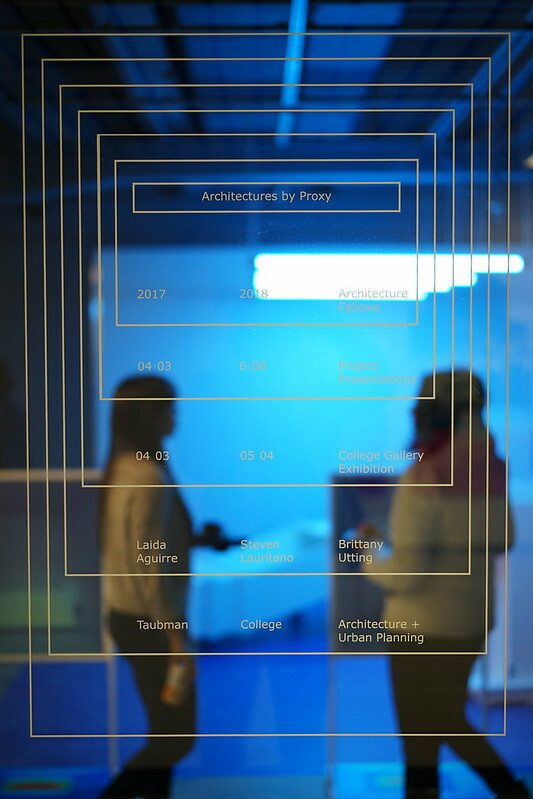 Through research and exhibitions her work examines the disciplinary periphery of architecture and attempts to extract covert systems of authorship. Laida’s work has been exhibited in Los Angeles, San Sebastian, New York, Berlin, Oslo and Stockholm. She is co-founder of the design studio Cartouche with Ariana Rubcic. Steven Lauritano is a theorist and historian of architecture and the visual arts. He earned his doctorate from Yale University in December 2016 and is currently completing a book project on Karl Friedrich Schinkel’s conception of history, based on the Prussian designer’s experimental work with antique remains. Lauritano holds an MArch from Princeton University and has spent time in the office of Reiser + Umemoto. He is a former fellow of the Berlin Program for Advanced German and European Studies at the Freie Universität and a recipient of the Carter Manny Award for Research, granted by the Graham Foundation for Advanced Studies in the Fine Arts. His writings have appeared in Perspecta, Pidgin Magazine, Circo and 306090 Books. Brittany Utting holds a Master of Architecture from Yale University where she received the Sonia Albert Schimberg Prize as outstanding graduating woman and was awarded teaching fellowships under Peter Eisenman and Emmanuel Petit. She received a Bachelor of Science from Georgia Institute of Technology, graduating as Presidential Scholar and a founding member of the Shape Computation Laboratory, receiving the Presidential Undergraduate Research Award for her work on informal housing typologies. Currently, Brittany is practicing at Thomas Phifer and Partners and is a project designer on the Museum of Modern Art in Warsaw, Poland. Previously, Brittany worked at Log, Journal for Architecture and on the forthcoming book Alberti Analogous. Brittany's ongoing research considers the evolving image of the home, its competing mythologies and ideologies, as an index of a society’s habits of living and production as well as a measure of a culture’s collective desires. Presentations Tuesday, April 3 at 6:00pm, followed by an opening reception in the college gallery. Exhibition on view: April 4 - May 4.